We believe dental care should be a positive experience! Thanks to our professional team and advanced anesthesia options, we are able to offer comfortable dental procedures in a relaxed environment. We use The Wand®, computer-assisted numbing, to deliver anesthesia straight to the source. 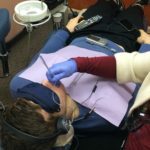 For patients who want an even more calming influence in the dental office, soothing, non-drug based sedation using alpha-stim and music with a bi-neural beat and soft eye covers for deep relaxation.